Montserrat was once called the “Emerald Isle of the Caribbean,” a phrase coined by Columbus. It is graced with lush mountains and landscape crowned by three towering volcanoes. Unfortunately, one of those volcanoes–the Soufrière Hills volcano–erupted in 1995, making most of the island uninhabitable. 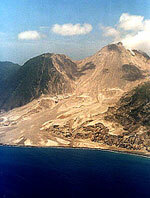 Now, most of Montserrat’s residents live off-island–many having since relocated to Britain–while a very few remain in the less affected northern part of the island, or in emergency shelters, while waiting out the “storm.” Even with a volcano that continues to erupt periodically, tourists visit Montserrat, though certainly not in the number they once did. The capitol of Plymouth, with its Georgian-style houses and winding streets, now lays under many feet of ash. Since the last major eruption, the governmental center of the island has been relocated to Brades near Carr’s Bay/Little Bay. But as of now, the island has no “cultural hub” like Plymouth was before the eruption. This can make finding provisions difficult since there is no major town center. The only people allowed into the restricted (read: dangerous) zone are scientists or people with business in that area. But there are many helicopter tours available to give you a bird’s-eye view of the southern portion of the island. Many locals who moved to England, Canada, or other British territories after the eruption are beginning to return and in the coming years Montserrat may again emerge as a major tourist destination, but for now it seems to only attract the courtesy of a few. If you are interested in visiting the island, it’s best to contact the tourist board for updated information. To get to Montserrat you must fly to Antigua and either take a ferry or a helicopter charter to the island; the latter will prove to be a much more expensive route. The ferry ride takes about one hour, while the helicopter takes just twenty minutes. You can also arrive via helicopter from St. Kitts. To see the ferry or helicopter schedules click here. Once on island, the best way to get around is either by taxi or rental a car. You can also get a bus tour from one of the island’s tour companies. Because of its location, the weather in Montserrat is almost always warm. The average high temperature throughout the year is around 80°F. The rainiest time of year is between June and December. Weatherwise, the least desirable time to visit is during hurricane season, which runs from June through October.